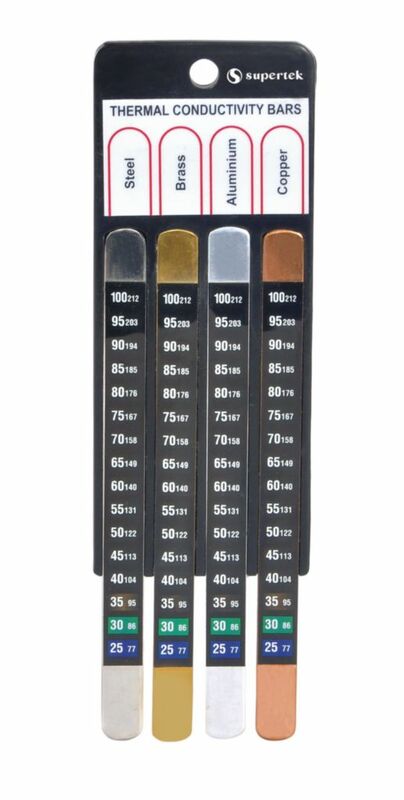 This new conductivity bar set features sensitive liquid crystal temperature indicators, which are attached to the front of each of four metal bars. The four bars of copper, aluminum, brass, and steel are firmly held parallel to one another in a rigid, molded carrier. Each bar has a cross-sectional area of 30 mm, and its conductivity value is marked on the back of the support. 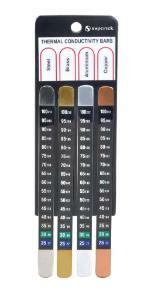 Temperature indicators are marked at 1 cm intervals. Within seconds of placing the ends of the bars in hot water, a visible "heat pulse" travels up the copper bar while the steel bar takes several minutes to conduct heat to its upper end. Timing the impulses enables estimates of the relative conductivities to be made for comparison with the given theoretical values.